We’ve found just a few models like this one, and it’s probably because it’s not so common for crossbow scopes to come with variable zoom. So, this is the primary advantage that you should take into account if you’re prospecting the market and don’t know whether you should give the Excalibur Tact-Zone a try. You can select the magnification between 2.5x and 6x, which obviously can give you a lot of versatility as you can use it for many types of prey and in different environments. The only con that we were able to discover in relation to this product is that it is not accompanied by any rings. Therefore, you will have to invest in them separately, and that might be an inconvenience especially since you also have to bother with compatibility. However, we would advise getting in touch with the manufacturing brand so that you get the right ones off the bat and avoid wasting time. As we’ve already mentioned at the beginning of the article, with the Excalibur Tact-Zone you get the advantage of a variable zoom. What this means for you is that you will be able to use the optical instrument so that you can target a host of preys and besides, you can also use it when you’re closer or farther to and from the animal. You won’t have to adjust your position in the wild because of the optical device — you’ll be able to comfortably make the necessary adjustments to it instead. You can set the one you want or need from 2.5x to 6x. Here’s where the Excalibur alternative is a winner, and that’s because it comes with fully multi-coated optical components. If you have no idea what that means, we’ll tell you. Compared to multi-coated, fully coated, and just plain coated lenses, fully multi-coated ones are capable of transmitting the light through the components as best as possible. What that means for you is that, even if you do your crossbow shooting in a more or less darker environment, you will still be able to understand what you are looking at. Many scopes lack quality in this sense, but not this one. No one likes carrying hefty equipment around, and when you’re also using a crossbow, adding extra weight to it because of the scope can definitely be a pain. Fortunately, with this product, you don’t need to worry about this aspect since it weighs in at less than 1 pound and it measures just about 13 inches in length. It is compact and can be made to fit a plethora of crossbows, but only with speeds ranging from 275 to 410 FPS. Although not as great as that of similar models, the one of the Excalibur Tact-Zone is enough for you to shoot at most targets. 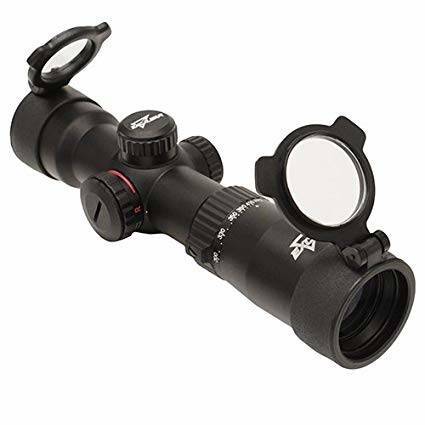 The FoV of this particular crossbow scope is around 45 feet at a magnification of 2.5, but it decreases to around 20 feet at a magnification of 6x. Keep in mind that the field of view is particularly important if you want to have a good sight of your prey and be able to track it comfortably and effectively so that you get a clear shot. Even though you won’t get any rings with your scope purchase, we thought it might be a good idea to tell you that, once you get them separately, you will be able to mount the optical device on your crossbow only in a matter of seconds. Therefore, you can start using it right away without having to fiddle with any parts. As for sighting in, it’s easy, but some hunters argue that it’s not exactly simple. Of course, you have to be aware of your crossbow’s speed, and if you aren’t sure what that is, you have to shoot an arrow through a chronograph to get the info. The best thing about the Excalibur is that some hunters have noted that once it’s sighted in, it holds zero perfectly, withstanding even drops. 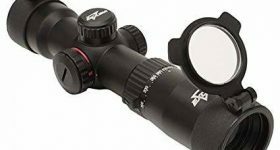 The Excalibur Tact-Zone 2.5-6x32mm crossbow scope comes with a quality build, a lightweight design, and yet it boasts fully multi-coated lenses, which makes it take the cake when it comes to ensuring image brightness. The variable zoom is versatile, to say the least, and the device is overall easy to mount and work with.